Lusciously creamy, spicy hummus topped with a zesty minced jalapeño salsa and ready to be devoured! 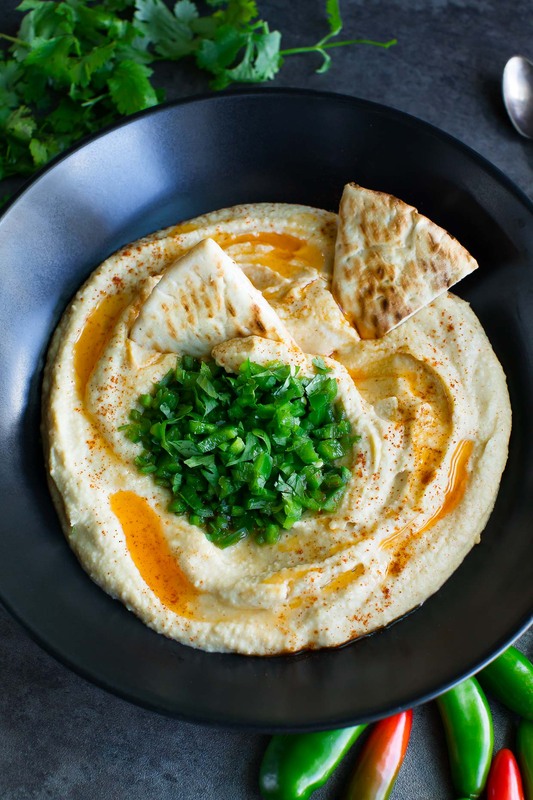 I’m completely bonkers for this fiery and flavorful hummus and can’t wait for you to try it! I cannot for the life of me stop thinking about this hummus. The hummus itself is ultra creamy and velvety, and kissed with a tasty blend of tahini, lemon, garlic, and cumin. The spicy topping adds a fun and fiery twist, and I can not for the life of me stop eating when it’s around! 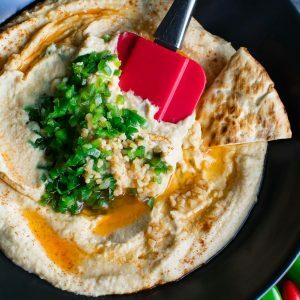 Serve this spicy hummus with fluffy pita wedges and fresh sliced veggies and get ready to faceplant! My all-time favorite dipper for this hummus is crinkle cut carrot chips. They have the feel and crunch of a chip with way fewer calories the added bonus of vitamins, antioxidants, and all that jazz. My grocery store carries big bags of them next to the baby carrots and since they’re basically the only way my 5-year-old eats carrots outside of baked goods, we buy them a LOT. I also love this dip with celery, bell pepper slices, sliced cucumber, broccoli, and cauliflower florets. So some of you may be scratching your heads wondering what on Earth jalapeño salsa is…. I shall explain! I’ve long been obsessed with Mrs. Renfro’s green salsa. 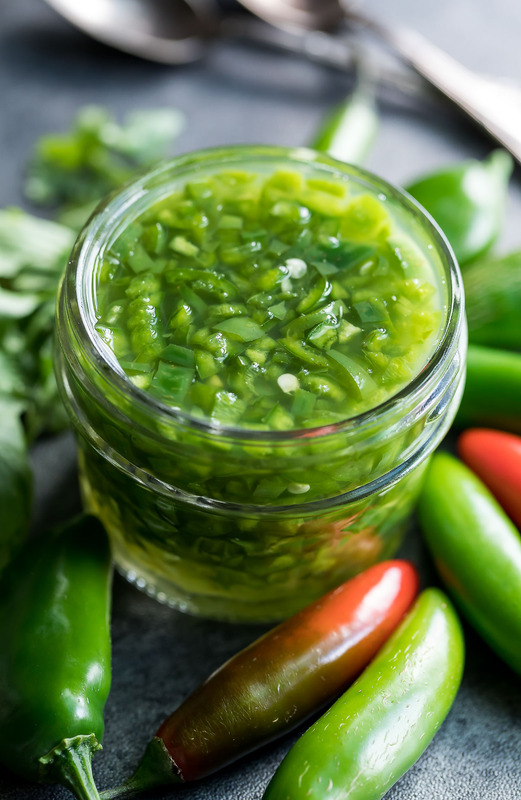 My husband and I always just assumed this tasty jar-o-green was salsa verde (aka tomatillo salsa) but we were oh so wrong! It’s actually jalapeño salsa and it. is. AMAZING. I decided making a fresh version of this salsa would be the perfect topper for my spicy hummus. I raided my garden for jalapeños and wound up using a half-dozen in this easy peasy recipe. You’ll use less if you’re buying your jalapeños from the store, as they tend to be much larger than my garden peppers. We’re basically aiming for 1/2 cup of minced jalapeño. To round out the flavors, I added some lemon juice, salt and sugar (to nix some of the heat – my peppers were SPICY!) then swirled it with a combination of water and vinegar to brighten it up even further. It kind of has a fresh pickled jalapeño vibe but without the heating, waiting, and pickling shenanigans. I’m super happy to report that I am stuffing my face with this hummus while writing up the recipe. 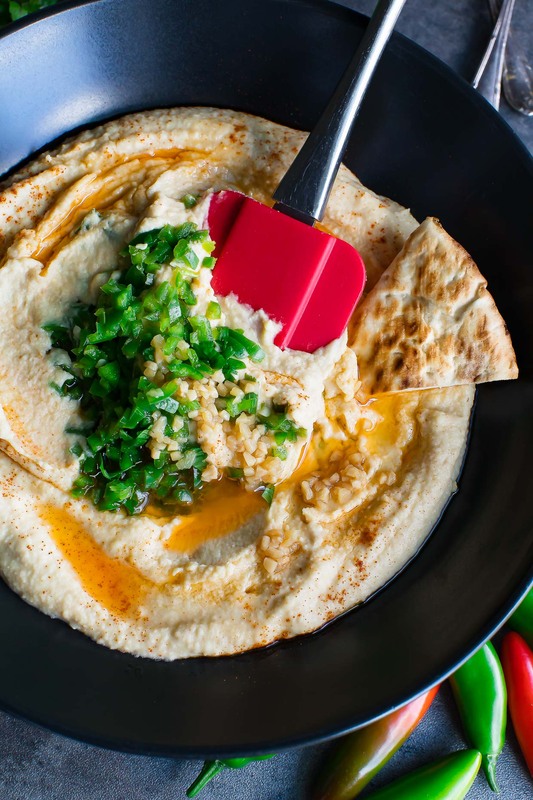 This smooth and lemony jalapeño-topped hummus is crazy delicious! Lusciously creamy, spicy hummus topped with a zesty minced jalapeño salsa and ready to be devoured! I'm completely bonkers for this fiery, flavorful hummus and can't wait for you to try it! extra virgin olive oil for drizzling grab a regular one or a spicy infused oil! Cooking canned chickpeas is my favorite hack for ULTRA creamy hummus! Drain and rinse your beans then add to a medium saucepan with 1/2 tsp baking soda. Pour in water until water line is about 1-2 inches above the chickpeas and set to boil on high. Boil for 20 minutes, tossing in 2 cloves of garlic in with it after 10 minutes. While the chickpeas boil, start your salsa. Slice the stems off the peppers and cut in half lengthwise. Scoop out the seeds/membrane with a spoon or gloved fingers if needed. Cut peppers into strips and finely mince. Place in a small bowl with remaining ingredients (and any jalapeño seeds you want to add back in for extra heat) and allow to marinate. Pour chickpeas and garlic into a fine mesh strainer and drain. You can remove any skins that may have popped off if you'd like but it's totally optional! In a trusty food processor or high-powered blender, add chickpeas, lemon juice, sea salt, cayenne, cumin, and olive oil. Blend well. Scrape down the sides if needed, and add tahini and ice water. Continue blending until hummus is delightfully creamy. Feel free to add any extra tahini or ice water if needed to thin the hummus. Next any extra seasoning to taste (I always dive in with a carrot or pita wedge to taste test) and scrape into a bowl for serving. Drain the liquid (we only needed it to marinate the peppers), then place a pile of jalapeño goodness in the center of your hummus. Drizzle hummus with olive oil, sprinkle with paprika, and dive in with your favorite veggies and pita! * My backyard jalapeños are usually about 2 inches long. Buying them at the grocery store? Aim for 2-3 medium peppers. The jalapeño salsa can be fiery with a capital F-I-R-E if you're so inclined. The more seeds you allow into the salsa, the spicier it will be. My garden has really fiery peppers so I opted for a spoonful of sugar in the salsa to calm things down a bit. Feel free to make your salsa as spicy or as mild as you'd like so by all means, adjust to taste. I had some jarred garlic on hand and added little drizzle over the top of my salsa and hummus. Feel free to follow suit if you're also a garlic fiend! You could also sauté fresh minced garlic in a little olive oil and use it for drizzling on top. 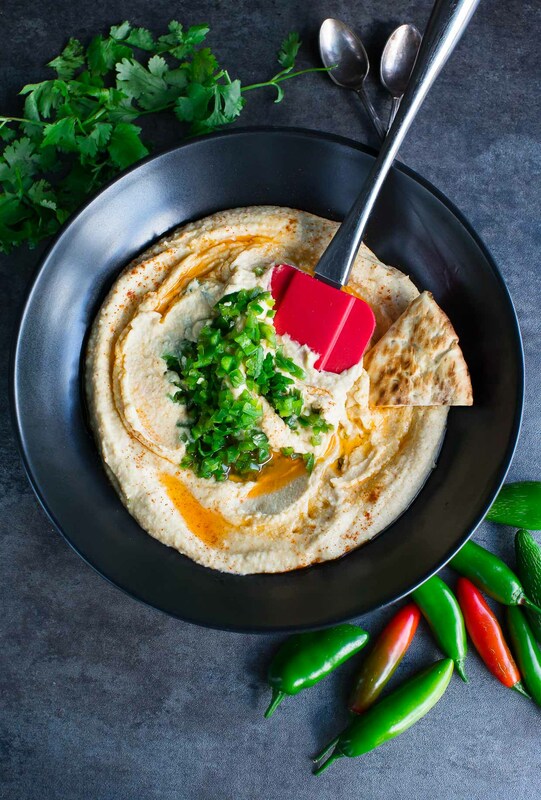 If you get a chance to try this scrumptious spicy hummus recipe, let me know! Leave some love in the comment form below or tag your photos with @peasandcrayons on Instagram so I can happy dance over your creation! Can’t wait to try this! Quick question – If I use an instant pot to cook dried chick peas, do you think I should then do the boil with baking soda after? I love super creamy, velvety hummus and want to do whatever I can to make it that way. So stoked for you to try it! Hookay so are you making chickpeas for multiple recipes for the week or just what you need for the hummus? The trick seems to be to overcook the chickpeas a little until tender (vs. al dente like we buy in the can) so if you’re using them for other recipes I’d say yeah boil and baking soda those babies! If you’re just making enough for hummus simply overcook a bit in the IP and you should be good to go! Addictive hummus! Just enough spicy that the heat-lovers are satisfied and the less adventurous crowd can hang. Kick it up a notch with jalapeño-seasoned pita chips or keep it mellow and a little sweet with carrot chips. Either one is the perfect vehicle for shoveling maximum amounts into your face. So so glad you enjoyed it Kristin, thank you! I’m already dreaming up new ways to deliver this dip into my face too haha! Love it so! So stoked for you to try it! Thank you!